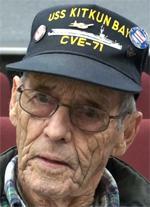 1943 Enlisted in 1943 World War II USS Kitkun CVE-71 aircraft carrier, was tail gunner on Avenger as he did not make a pilot. Thought he was invisible at the age of 18 and few a lot of missions. Pilot, turret gunner with a 50 caliber and 30 caliber tail gun. Favorite plane was P-51 but did fly in a Dauntless dive bomber and got to take the controls. On one mission, plane caught on fire and was considering to bail out but pilot was able to get the fire out. Landing on an aircraft carrier is like crashing a plane. One day he did not see the takeoff command and did not prepare himself so almost broke his back from the force of the catapult. 1944 January 1944 to April 1947. Was on six trips, Italy, India, France, Japan, and South America to bring supplies.